The Newcastle United Blog | » Is Newcastle Career Over For This Former Top Youngster? Is Newcastle Career Over For This Former Top Youngster? When Haris Vuckic first arrived on Tyneside in January of 2009 from NK Domzale in Slovenia,he was one of the top young players in Europe at only 16 years of age, and much was expected from the Ljubljana, Slovenia born player. Newcastle beat a lot of top European clubs in getting the youngster from Slovenia, and at the time it was thought to be a coup for Newcastle. 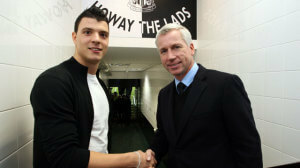 And when Alan Pardew arrived at Newcastle almost four years ago in December of 2010, he was told one of Newcastle’s best young players was Haris, and the manager quickly signed him to an extended deal in January of 2011, which runs out in the summer of 2016 – so Haris has a little over 18 months left on that contract. But he has a hard job making the bench these days, and plays his football for the impressive Newcastle U21 side, after spending time out on loan at Cardiff City in 2012, and Rotherham for the second half of last season. Vuckic has had far too many injuries during his time at Newcastle, and that has certainly hampered his progress at the club. The Newcastle U21 side hope to go top of the Barclays U-21 Premier League Division 2, when we play Stoke City at the Britannia Stadium on Thursday, and we need a point to go above Arsenal to the top of the league. Haris has to play well for the U21 side so he can again force himself into Pardew’s first team match day squad of 18. And he can take encouragement from the way Mehdi Abeid has come through to the first team, after his season-long loan deal in Greece last year and the two players are very close in age – with Haris being 15 days younger than Mehdi. But the 6′ 1¨ tall 22 year-old will have to make a move into the first team soon, if his career is going to continue at Newcastle, because time is running out. We hope the Slovenian International can be yet another youngster who comes through to the first team this season. Haris has played 18 times for the Newcastle first team with one goal – so far. If we become short of options in attacking midfield then maybe give him a chance and see if he can produce some good form but to be honest, I don’t see him breaking into our first team this season. Wasn’t he mainly on the bench at Rotherham? Who would people want in January for CB? Ashley Williams? don’t shoot me! he’s 22 now and if i’m right needs a squad number ! always been injury prone but is like a keiron dyer type as in potential to be great but never fit for long enough to ever do anything and the only way he will get better is to play which he certainly wont be doing in our club. we have a new super talented young cm now in mackenzie heaney who will hopefully turn out better in 3-5 years time so think we should let vukic take the chance to be a star in another league maybe abroad where he wont get injured so much because of a slower pace. doesn’t this story get posted every year? He’s never progressed like the others have and he’s injury prone! In response to your post on previous post regarding leadership in back 4. I believe that Janmaat is our next Captain in waiting! Im sure he will be more than capable leading the line alongside Lascelles who is very vocal for Forest when I watched him last year! Which way will our club head next? We had the dire start, unable to win at all, looking lost on the pitch. Then a complete turnaround which happened with the introduction of younger players and a change in the positions played by a key few. We also saw a resurgence in Colo and some steady play from Taylor. Dummett looks good so far at CB as well. To me it looks as if we will probably be able to retain a mid table place now which I never would have believed after the first 8 games or so. Strange days indeed. For example I’m predicting a 0-3 loss to QPR next. Beautiful. I admit that I haven’t seen Lascelles play at all but I hope the reports are accurate and the step-up achievable of course. I have seen a few posts talking up Steven Taylor and I just don’t get how short people’s memories are. To my mind, he will always be a liability. I sit next to a few guys in the Gallowgate end who are constantly on Dummett’s back, which I really don’t get – the lad is still learning. I really think it will be a draw. Have watched QPR, they ain’t as bad as their position suggests. We are on a run which must end… a draw. Of course my brilliant haiku from yesterday summarizes it all really. If you are very brave wolfie then go ahead mate. 🙂 Cyprus, that gets a big Harrumph! from me. Draws are horrible, especially at home. Looking at fixtures… West Ham- draw too…. Can anyone comment on Burnley? Will we beat them away… Will Arsenal deliver the annual spanking or are they weaker than ever… I see us getting something from Chelsea… ok, that’s it, this glass ball thing is exhausting, especially with this team. A team could be theoretically invincible, 0 losses, 38 draws and go down. Would that be cool? How Vuckic can success in this club when he never get a chance to play.I think that he will do a excellent job on that left winger position(I forgot this player that exists).Thanks for reminding me.Bigirimana has 5 players that share his position and because of that he can’t play.But this player can play right now in the starting eleven.He is typical left winger.Remember we are without available wingers at the moment. Where is Mr. Tufties today? He is usually on here by now. And Jail? I’m worried we’ll all let Pardew off the hook after a few wins (although they have been very good ones). Who would have believed we would beat Spurs away and knock Man City out of the cup away? Am I dreaming this or did it actually happen? 1.86 cm are not ideal height for winger but Pardew can try with him when other options aren’t available. G2 – I’ve already posted a couple of times today warning fellow posters of the celebratory exploding cigar – currently being puffed on the the pro Percy Brigade. Very good point Mr. Tuff. I hope they are reading this and taking it to heart. Don’t get carried away yet you Pardew lovers. There is a long way to go. Still I have to say I’m shocked and pleased by the recent results. Just got an update from beermonkey about the whole Norwegian mountain troll situation by the way. He says the whole thing is greatly exaggerated. He seems strangely hung over for a lad who supposedly spent the last 3 days in the mountains looking for trolls however. Hmmmmm. I’ve always cheered for this fellow. What has gone on with Mehdi Abeid this season shows there is some hope for Haris, too. I recall Haris playing, I think, two years ago, and he had a game (against Blackburn?) where he hit the crossbar and post in the same game and showed good skill. We all thought Gabby Obertan was “the forgotten man”, too and barring injury, he would have likely earned himself at least strong consideration of a new contract/extension. Maybe all Haris needs is some time in the first team. Seems the trick is to loan him out to a team in the Cl or Europa where he can get work vs. better players. Look at Abeid.